Last year, I had a couple of posts about preference shares in general (part 1 and part 2) and spreads between German common shares and pref shares in particular (here). II looked at a post of Valuation Guru Damodaran, who tries to come up with a theory of explaining the spreads between votung an non-voting shares. Among other factors, his assumption is that shares with voting rights should generally trade at a premium and c.p. the premium should be higher for badly managed companies where a change of control event is likely. When we looked at German pref shares, we could see that in certain cases this held up but not in general. 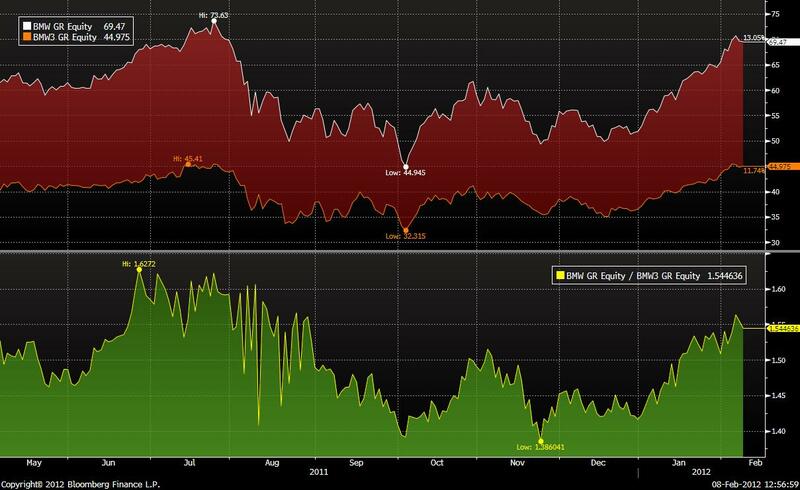 Most interesting is the developement at Metro, where spreads between prefs and common shares almost disappeared. The most prominent example against Damodaran’s theory, BMW (well managed, no chance of change in control) even increased it’s spread. Personally, I don’t really understand this. Of course liquidity is better for the common shares and they are in the DAX, but a 50% higher valuation for the common shares with a controlling shareholder family who does not want to sell doesn’t make sense. Another intersting idea from Thomtrader are Hyundai Motors pref shares. Hyundai pref shares (3 different series) trade at around 48-60 k Won against 220 k for the regular shares. That is a ratio of ~4-5:1, a massive discount. Again, this can not be explained through “conventional wisdom”. Although I do not want to own them outright, a long Hyundai Pref short common shares trade looks interesting. One could buy 4 Pref shares and short (I don’t know if this is possible in reality) 1 common share. 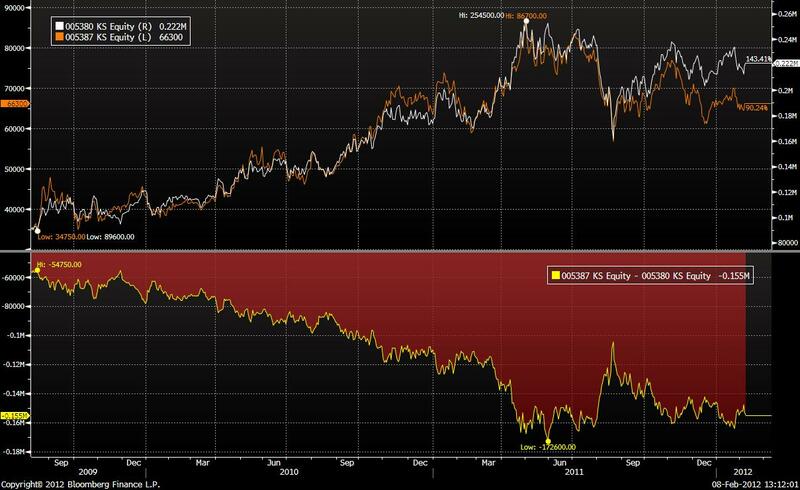 Historical correlation is around 0.85, not perfect but Ok. The nice thing is that we have a good carry of ~ 3 pref dividends, which translates into a “carry” of around 7% for the nominal position (in hedgefund lingo) before borrowing costs, non-frefundable taxes etc..
Again the “Volkswagen” risk of shorting common shares should be relatively small as it is yet to be proved that anyone can take over a Korean Company. This is a trade I am actually considering is another “capital structure” trade similar to the Draegerwerke long/short. UPDATE: I just saw that there are single stock futures traded in Korea. I am not sure if a private investor can trade this but as an institutional invetsor, this should be possible. Metro VZ is now higher than Metro St. Any explanation? Imho this doesn’t make sense. interestingly, from the end of 2001 until 2006, the Metro Pref shares traded higher than the common shares. Und ich glaube, dass die annährende Gleichsetzung VZ-Aktie mit ST-Aktie ein deutsches Denken ist. In anderen Ländern sieht man eine VZ-Aktie wohl eher als Fremdkapital an, da man eben gar nichts mitzubestimmen hat. Und wenn man dann bedenkt, dass ein Kupon und die Rückzahlung zu 100% einer Anleihe (ohne Insolvenz) “sicher” ist, aber Dividende sowie Kursverlauf unsicher ist, dann dürfte eine BMW-VZ eben einen “normalen” Wert haben. in Korea ging bis jetzt noch nie was, allerdings ist gutes risk management nötig. Zum Bond Vergleich: Eine BMW Anleihe hat leider nicht den Coupon in den letzten Jahren um 50% erhöht.Die Vorzugsaktie ist eine Aktie mit dem gleichen Gewinnanteilwie eine Aktie,es fehlt lediglich das Stimmrecht.Bewertungsmaßstab ist deshalb die Aktie. 2. Dürfen m.W. viele US-Fonds gar keine Vorzugsaktien kaufen. As a shareholder of a preferred share you are generally allowed to visit the AGM, you just cannot vote. This makes the BMW spread much, much harder to believe as all preferred shareholders can test drive the new cars and enjoy Weißwurst while Family Quandt + ordinary shareholders have to concentrate on voting. very interesting! Could you upload the same table as above, including the free float of the common stock? – It would be interesting to see whether there is a correlation between the degree of control and the preference/common-spread. Normally, the spread should increase with “major shareholder risk”, i.e. the possibility to be defrauded by the major shareholder as an holder of the preference. the “defrauding” theory is quite interesting. This might maybe explain some differences as well between different jurisdictions. Edit: It does not explain BMW in my opinion. Fully agree on BMW – especially since the prefered also carry a higher dividend.